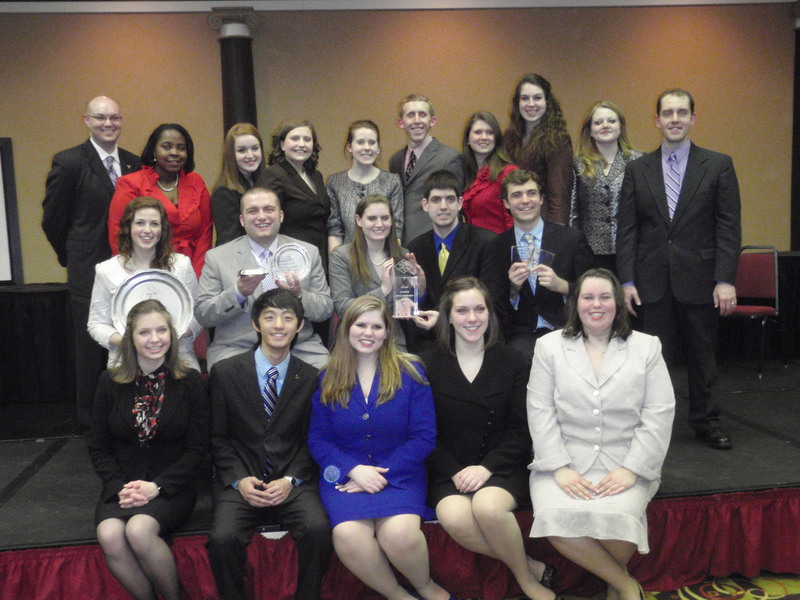 The Gustavus forensics team celebrates its top 10 finish at this year's AFA-NIET in Kearney, Nebraska. For the second straight year, the Gustavus Adolphus College forensics team has earned a top 10 national ranking at the American Forensic Association’s National Individual Events Tournament (AFA-NIET). The team earned 152.5 points to finish in 10th place at the tournament, which took place at the University of Nebraska-Kearney April 2-4. Western Kentucky University took first place in the team sweepstakes with 412 points. Gustavus is one of only a few smaller colleges that placed in the top 20 which is dominated by larger research universities. In addition to the tremendous team accomplishment, several individuals also earned distinctive honors at the AFA-NIET. Gustavus junior Chloe Radcliffe will return to St. Peter with an individual national championship after taking first place in Prose Interpretation. Radcliffe beat out 165 other competitors in the category to become the first Gustavus student to earn a national championship at the AFA-NIET. Senior Phil Helt advanced to the semifinals in Impromptu Speaking and the quarterfinals in Persuasion. Helt was also named to the 2011 AFA-NIET All-American Team, which selects students based on scholastic achievement, AFA-NIET forensic participation, and community service. Junior Sam Hemmerich broke two events to out-rounds, advancing to the quarterfinals in both Drama and Prose Interpretation. Other team members who competed at the AFA-NIET included seniors Eric Cronin and Claire Sagstuen; sophomores Kate Bissen, Kaitlin Burlingame, Vanessa Condon, Hannah Engel, and Christopher Moua; and first-year students Kelsey Abele, Kirsten Craft, Justin Feit, Ava Goepfert, Mariecus Jarvis, Sonja Johnson, and Shelby Wilds. This year marks the fifth straight year that the Gustavus forensics team has earned a top 20 national ranking. The team finished 2007 and 2008 as the No. 20 ranked team in the country. In 2009 the team finished in season ranked No. 18 before jumping to No. 10 in 2010. Gustavus is one of only 11 schools, and the only non-Division I school, to be ranked in the top 20 in each of the past five years. Click here to view the full results from this year’s AFA-NIET. Click here to learn more about the Gustavus forensics team. Way to go Gusties!!! All your hard work and dedication paid off!! An honor well deserved to the coaches and the students. We are proud of you!